Let's start with the basics. Perhaps you're wondering, What does it mean to consolidate my student loans? Consolidation works by combining several several loans into a single monthly payment. This not only simplifies your student loan repayment, but it can also lower the monthly amount you pay toward student loan debt. If you have loans through the government, it often makes sense to bring them under one umbrella. Here's how this process works: When you consolidate, the government turns your existing federal student loans into a single Direct Consolidation Loan. However, it's important to know that the interest rate on your Direct Consolidation Loan is not always lower. Instead, the rate is calculated by taking the weighted average of the interest rates on your existing loans and then rounding up to the nearest one-eighth of 1%. This new rate is fixed for the life of the loan. So, is it smart to consolidate your federal student loans? Instead of having different loan payments due each month, consolidating allows you to make just one easy payment. You'll be able to apply for an income-driven repayment plan, allowing you to make payments more manageable for your financial situation. You'll be able to take advantage of Public Service Loan Forgiveness Program (PSLF) if you work for a qualifying employer. Only Direct loans qualify for this program. You might end up paying more interest in the long-run, and it could take you longer to pay off your debt. Because of how student loan payments are applied, opting for a single, smaller monthly payment without lowering your interest rate means less of your money will go toward the principal every month. You'll lose certain benefits from specific loans. As an example, federal Perkins Loans are forgiven for some teachers who work in low-income areas, for some law enforcement officers, and for some other public sector employees. But once Perkins Loans are consolidated as part of a Direct Consolidation Loan, you'll lose this forgiveness benefit if you were counting on it. If you've been making payments toward loan forgiveness, you'll lose any credit for qualifying payments after you consolidate. Essentially, the clock starts over. 2. When you're ready, complete the application online or by calling the Federal Loan Consolidation Information Call Center at 1-800-557-7392. It takes at least 30 minutes to complete the application. If you use the online application, you'll see this screen, from which you need to login with your ID. 3. 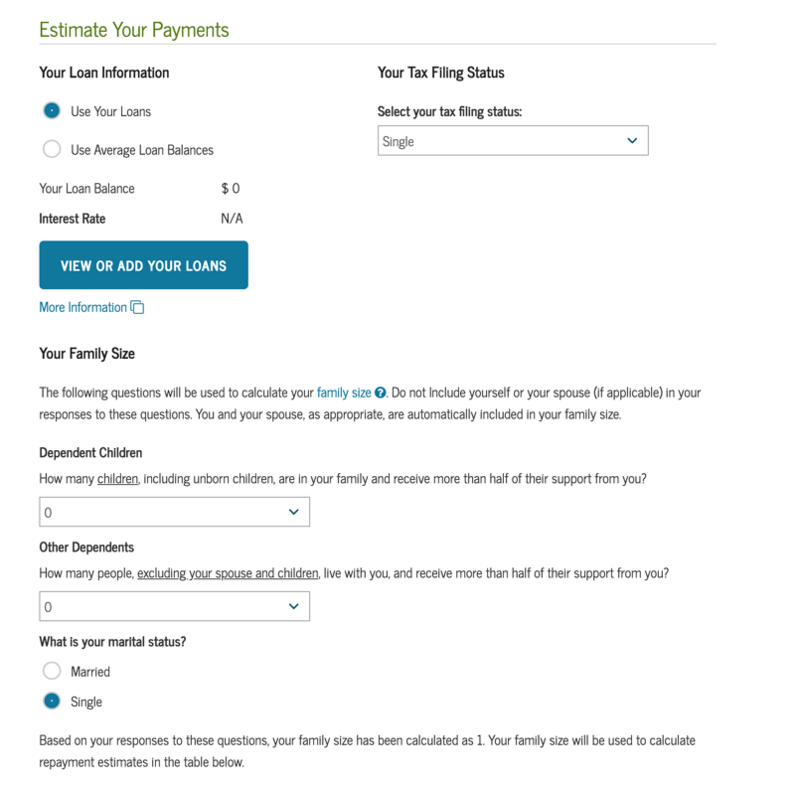 Using Federal Student Aid’s Repayment Estimator, you can see what your monthly payment would be on each of the income-driven repayment plans. You can also call your loan servicer and ask which plan could save you the most money over the life of your loan, or lower your monthly payment. 4. Typically, the first payment of your consolidated loan will need to be made within 60 days. IMPORTANT: Until your loan servicer contacts you with a due date and instructions for payment, keep making payments on your old loans. Have private student loans that you'd like to consolidate? You might be wondering if it's even possible. It is, but you have to go about it a different way. The truth is you can't consolidate private student loans through the federal government. Instead, you consolidate your loans refinancing through a private lender. Like federal consolidation, refinancing allows you to combine your loans into a single monthly bill. Essentially, refinancing is when you take out a new loan with new loan terms to pay off your existing debt. Is it smart to refinance your student loans? See also: Should I Refinance My Student Loans? Refinancing saves you money. People who refinance with private lenders, on average, lower their payments by $253 a month or save $16,183 over the life of their loans. To find out how much you could save, check out our Student Loan Refinancing Calculator. Like consolidation, refinancing simplifies student debt repayment by converting your existing loans into a single loan with a single monthly payment. Typically, refinancing gives you a lower interest rate and lower monthly payments. You may also choose to extend your repayment term, which can lower your monthly payments even further. Most lenders that refinance student loans allow flexible repayment options so that borrowers can the best fit for their particular situation. Most reputable lenders do not charge a fee for refinancing your student loans. Some private lenders career-specific programs for those completing medical or dental residencies. Private lenders look for good credit and a low debt-to-income ratio. That means that if you have less than excellent credit, high debt-to-income ratio or you've had an unstable employment history, you might not be able to refinance without a cosigner. 1. Use our Student Loan Consolidation Calculator to see how much you could save by refinancing multiple loans into one new one. This should give you a good idea whether refinancing is the right choice for you. You can also take this 7-question quiz to find out. You can compare lenders' rates and loan terms directly on CometFi.com. You should also consider calling the lenders at the top of your list to see what their customer service is like. Since you'll be in a long-term relationship with your lender once you refinance, you want to make sure that not only their rates and loan terms are good but that they'll respond appropriately when you need support. 2. Submit an application with your lender of choice. Start by completing an initial inquiry with your top two or three choices. This isn't the same as the full application process, so it won't impact your credit score, but it will give you an idea of what rate you qualify for with each lender. Once these lenders give you an initial offer with an interest rate, loan terms, and an estimated monthly payment, compare the results side-by-side. Consider not only your monthly payment but also how much you’ll pay in the long run. Information about your current loans, including your original and current loan balance, interest rate, servicer name and address, and payoff date. Your driver’s license, passport or a bank statement to verify your address. Your last month’s pay stubs. Chances are that you have both federal and private student loans. In this case, a private lender can help you consolidate both types of loans into one new payment if that's what you'd like to do. But remember, it's not an all-or-nothing scenario. You can pick and choose which loans to consolidate or refinance based on interest rates or how close you are to paying them off. Consolidate your federal loans into a Direct Consolidation Loan, and refinance your private loans with a private lender. This will give you two student loan payments each month. The major upside is that you'll retain the benefits of federal student loans, while getting lower interest rates on your private loans. Refinance all of your loans, simplifying repayment into a single monthly payment. Refinance or consolidate only certain loans. Some borrowers might benefit more from consolidating their federal loans, while others may prefer the savings of private refinancing. Or you may want to pick and choose and leave some loans out of the equation. "What are my current interest rates?" If one of your federal loan rates is already low, for example, you might prefer to pay it off without consolidating or refinancing. "Have I begun to make payments toward student loan forgiveness?" If so, you may choose to keep paying this specific loan since the clock resets on qualifying payments after you consolidate. And remember, forgiveness not even an option after refinancing with a private lender. "Do I want a lower interest rate?" If so, refinancing is your best bet. When you consolidate, your interest rate is calculated by taking the weighted average of the rates on your federal loans. "Do I want to make payments based on my income?" If the answer is yes, then you may want to consolidate your federal loans. If you refinance federal loans, you lose benefits like income-driven repayment plans. See also: Should You Refinance Your Federal Loans Through a Private Lender? As we've explained above, both refinancing and consolidating have their pros and cons. You can use our Student Loan Refinancing Calculator or Student Loan Consolidation Calculator to see how these options will impact your monthly payments. Once you've decided which loans you want to consolidate, which you want to refinance, and which you might to leave alone, follow the application instructions detailed above. We’re here to help with answers to your most pressing questions about consolidating your student loans. Is student loan consolidation the same as refinancing? Can I save money by consolidating my student loans? When should I avoid student loan consolidation? What benefits will I lose? How do I consolidate my federal student loans? How do I consolidate my private student loans? Which student loans can be consolidated? When can you consolidate student loans? Can you consolidate student loans that are in default? Should I consolidate my federal and private student loans together? When you consolidate your student loans, you combine all your separate student loans and pay them off as a single new loan. Depending on the types of loans you have and your financial goals, you may choose to consolidate through a federal Direct Consolidation Loan with the U.S. Department of Education, or with a private lender as part of a refinancing process. Federal consolidation won’t reduce your debt or your interest rate, and it may not lower your monthly payment. But it will mean fewer bills. See also: Should I Consolidate My Student Loans? Is student loans consolidation the same as refinancing? When people talk about student loan consolidation, they’re generally referring to consolidating federal loans through a Direct Consolidation Loan from the U.S. Department of Education. However, refinancing with a private lender can also result in joining multiple loans into a single payment. When you refinance, a private bank purchases all your loans and provides you with an entirely new loan and a new, often lower, interest rate that’s based on your debt-to-income ratio and credit history. You also get a new loan if you consolidate with the federal government, but the resulting interest rate is simply the weighted average of all the interest rates on all your old loans. And it isn’t based on your credit score — which can be a positive if your credit isn’t good, or if you have a fairly new credit history. However, if you have a high credit score and you consolidate to a federal loan, you may lose out on getting a lower interest rate that could save you thousands of dollars over the life of your loan. Replace multiple loans with a single monthly bill. Shorten or lengthen your repayment term. However, if you refinance federal student loans with a private company, you lose access to federal income-based repayment plans and loan forgiveness programs. See also: Student Loan Refinancing and Consolidation Terms You Need to Know. Whether you’ll save money by consolidating your loans depends on your particular situation. For instance, consolidating your student loans through a federal Direct Consolidation Loan could lower your monthly payments in the short-term if you extend your repayment term, but you may end up paying more over the life of the loan than you’re paying under your current plan. Here’s why: when you consolidate federal loans, the U.S. Department of Education sets your consolidated interest rate as a weighted average of the interest rates of all your old loans, rounded up the nearest one-eighth percent. But if you consolidate your loans by refinancing with a private lender, you may qualify for a lower interest rate that could save you money both in the short-term and the long-term. Reducing your interest rate by even 1% could yield thousands of dollars in savings over the life of your loan. Our Student Loan Consolidation Calculator can help you figure out whether consolidation will save you money. Each borrower’s financial situation is unique, so only you can say whether consolidating your student loans is a good idea for you. Knowing the pros and cons of consolidation can help you make a decision. Avoid the risk of default. Opt for a longer payment term that could lower your monthly payments. Remain eligible for federal income-driven repayment plans, deferment and forbearance, as well as loan forgiveness programs. If you extend your repayment term with a federal Direct Consolidation Loan, you’ll likely end up paying more interest over the life of the loan. If you’re thinking of consolidating through refinancing with a private lender, the loan shopping process can cause a slight dip in your credit score. Minimize this by limiting your shopping to a 15-day period. Your credit score doesn’t impact your interest rate with a federal Direct Consolidation Loan, but a low credit score could keep you from getting a better interest rate if you pursue refinancing through a private lender. Applying for refinancing with a cosigner may help you get a better rate if you don’t qualify for a competitive rate on your own. If you qualify for Public Service Loan Forgiveness (PSLF) and you’ve already made progress on your 10 years of payments, consolidating through a federal Direct Consolidation Loan resets the clock. Refinancing with a private lender will void your eligibility altogether. See also: Should You Refinance or Consolidate Your Student Loans? As we mentioned above, there are some important things to consider before you apply to consolidate your student loans, like whether you’ll lose access to federal benefit programs. You don’t have a steady income. Federal loans come with the possibility of deferment, forbearance, or income-driven plans that you can take advantage of if you hit a financial rough patch. You’re planning to use the Public Service Loan Forgiveness (PSLF) program to get your debt erased after 10 years. You’ll lose eligibility for that program. You have poor credit. A bank will use your credit score to determine the interest rate when consolidating with a private lender. A low credit score may not result in the lower interest rate you want. If you consolidate your student loans through the federal Direct Consolidation Loan program, you’ll retain eligibility for federal loan forgiveness, deferment and forbearance, as well as income-driven repayment plans. But any payments you made prior to consolidating will no longer count toward the PSLF program if you’re planning to use it. Remember, consolidating resets the clock. So if, for instance, you’ve been making payments for five years and are eligible for PSLF, it might be better to manage multiple monthly payments for another five years than to consolidate and wait ten years before your loans are forgiven. See also: Student Loan Forgiveness: What You Need to Know. You can consolidate your federal student loans online through the U.S. Department of Education at studentloans.gov. The whole process takes less than 30 minutes. But be careful: once you start the application, you can’t save it. You can also consolidate your federal student loans by refinancing with a private lender. Most lenders have easy-to-use online applications. Before you apply, we recommend comparing terms and repayment options of at least three different companies so you can be sure you’re getting a loan that works best for you. Once you’ve considered how the monthly payments and total payment amounts will impact your current financial situation, fill out the online application for the bank that meets your needs. Use our Student Loan Consolidation Calculator to see how consolidation may affect your monthly payments. Private student loans are not eligible for consolidation through a federal Direct Consolidation Loan, but you can consolidate your private student loans by refinancing with a private lender. With numerous banks offering student loan refinancing, choosing a lender can be overwhelming. We recommend comparing the terms and repayment options of at least three different lenders before you apply. See our picks for Best Banks for Refinancing and Consolidating. Once you’ve made a decision, filling out an online application generally takes around 15 minutes. See also: Pros and Cons: Private Student Loan Consolidation. You can consolidate other private and federal loans by refinancing with a private lender. Remember that if you refinance federal loans with a private lender, you will lose income-driven repayment and forgiveness options. See also: Can You Consolidate Student Loans With Your Spouse? You can’t consolidate federal loans through a federal Direct Consolidation Loan until after you graduate, leave school, or drop below half-time enrollment. You’ll also have a difficult time refinancing federal loans with a private lender if you’re still in school. Banks generally require proof of graduation with an application to refinance. They also want to see a steady income and a good credit score if you’re applying without a cosigner. If you’re between jobs or have a poor credit history, now may not be the time to consolidate through refinancing. See also: Can You Consolidate Your Student Loans if You Have Bad Credit? You may be able to consolidate student loans that are in default. If you’ve defaulted on federal student loans, you can usually consolidate through a Direct Consolidation Loan. The default will remain on your credit record, but consolidating can help get you back on track. However, private lenders will generally not allow you to refinance loans that are in default. If you’ve missed payments on your private loans, contact your lender as soon as possible to discuss repayment options. See also: How to Get Student Loans Out of Default — What You Need to Know About Loan Rehabilitation. Many borrowers end up with a mix of federal and private student loans. The good news is that you can consolidate those loans into a single monthly payment, but there are some important points to note. First, you can’t consolidate private student loans with the U.S. Department of Education. So if you’re interested in a federal Direct Consolidation Loan, you’ll only be able to consolidate your federal loans. However, you can consolidate both federal and private student loans together into one loan if you refinance with a private lender. You may also get the added benefit of a lower interest rate and reduced monthly payments. But because you’re refinancing with a private lender, you will lose access to any federal benefit programs you may have had access to on your federal loans, like income-driven repayment and loan forgiveness. Consider carefully whether you plan to take advantage of these programs before you refinance. See also: Quiz: Do You Need a Cosigner to Refinance Your Student Loans? Is consolidating your student loans right for you? With more options than ever to streamline your payments, managing multiple student loans doesn’t have to be your reality. In less a half hour, you could be mapping a clearer path out of debt. See our Student Loan Consolidation Calculator to learn more.